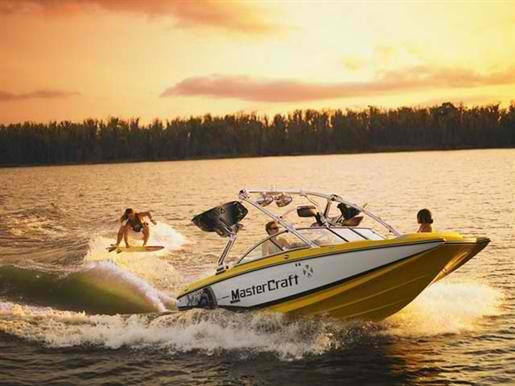 Lake Mcclure wakeboard boat, and ski boat rental information. Down stream from Yosemite Valley, Lake McClure has 7,100 surface acres when full and more than 80 miles of scenic shoreline to explore with any watercraft rentals. California boat rentals offers a boating vacation which can include all your favorite rentals including; jet ski rentals, boat charter and rentals, waverunner rentals, PWC rentals, and sea doo rentals. Lake Mcclure is framed by topography ranging from the rugged Merced River Canyon cliffs to oak-studded golden Sierra foothills. Houseboating is one of the best ways to discover Lake McClure on a three to seven day vacation. By day, houseboats are the perfect hub for the day's fishing trips, water skiing lessons, wake surf lessons, wakeboard runs, and swimming. Later, slip your houseboat into a secluded cove and enjoy a peaceful Central Sierra evening at Lake Mcclure. Besides storing water for irrigation, Lake Mcclure also provides opportunities for water recreation lessons. Only a small amount of water from the lake is used for drinking water. Activities available include lake tours, fishing, swimming, and jet ski rentals. There is a full service marina at the Lake Mcclure as well. The original Exchequer Dam, built between 1924 and 1926, was a concrete gravity arch dam, and created a reservoir with a capacity of 281,000, which was called Exchequer Reservoir until 1926, when its name was changed to Lake McClure to honor W.F. McClure, a California State Engineer. New Exchequer Dam was built to increase the reservoir's capacity. Invert Sports requires a three or more day's rental price for any watercraft rentals at Lake Mcclure. Enjoy the amazing outdoors with watercraft rental equipment at these marinas, launch ramps, and resorts around Lake Mcclure; Horseshoe Bend, Bagby Marina, Barretts Cove Marina, Mcclure Point Resort.